Thisstory was updated at 9:30 a.m. EDT. Twospacewalkers replaced an old door on the International Space Station earlyWednesday during a rare - and brief - internal service call that primed theoutpost for the arrival of a new Russian-built room later this year. 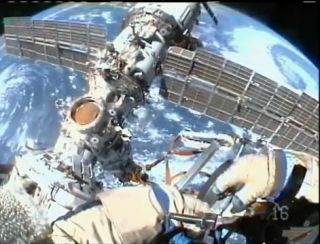 Russian cosmonautGennady Padalka and American astronautMichael Barratt spent just 12 minutes working in close quarters to removethe roof-mounted hatch cover in the forward transfer compartment of thestation?s Zvezda service module. They replaced the door with a docking conethat will allow Russia?s new Mini-ResearchModule 2 to latch onto the station in November. ?I thinkthis is it,? said Padalka, who commands the station?s six-man Expedition 20crew. ?Michael, you did such a great job replacing that cover.? It was atight fit for the two spacewalkers. Zvezda?s small spherical transfercompartment is only five feet (1.5 meters) across at its widest point, givinglittle room for Padalka and Barratt to move in their bulky Russian spacesuits. ?Michael,do you have enough space there?? asked Padalka after they two men squirmed intoposition. ?Yeah, Ihave more than enough,? Barratt replied. Today?sspacewalk began at 2:55 a.m. EDT (0655 GMT) and finished 12 minutes later,though Padalka and Barratt had a more than six-hour supply of air in case thedoor swap went awry. At no point did the two spacewalkers exit the spacestation or detach the spacesuit umbilical cables linking them to the outpost. Not since2001 have spacewalkers worked inside thespace station in a vacuum, NASA officials said. That earlier spacewalk wasperformed on June 8, 2001 - nearly eight years to the day of Wednesday?s work -by the station?s then-Expedition 2 crew to prime Zvezda to receive itsEarth-facing Pirs docking compartment. It lasted 19 minutes. NASA and Russia?sFederal Space Agency consider any activity in which astronauts and cosmonautswork in a vacuum as a spacewalk. Russian spacewalks are timed by the durationbetween a hatch opening and closing, while NASA spacewalks are measured by theperiod between the switch to a spacesuit?s internal battery power and airlockrepressurization. Russian cosmonauts also performed three internal spacewalksin 1997 to inspect and repair a damaged module on Russia?s Space Station Mir. Theinternal spacewalk by Padalka and Barratt was the second excursion dedicated topreparing the space station for its new Russian room. The two spacewalkersventured outside the station on June 5 to install docking antennas that willhelp the Mini-Research Module 2 attach to its final berth when it arrives thisfall. With thenew docking cone installed, the space station?s Zvezda module is now a stepcloser to welcoming Mini-Research Module 2, a new room slated to launch towardthe outpost atop an unmanned rocket. The modulewill add a new docking port to the space station, which currently has fouravailable berths, three on the Russian segment and one at the front of theoutpost on NASA?s Harmony connecting node. The spacestation needs more docking ports to support its larger, six-personcrew, which took up residence earlier this month. In addition to Padalkaand Barratt, another Russian cosmonaut and astronauts from Japan, Belgium andCanada currently live aboard the space station. Two RussianSoyuz vehicles are currently parked at the station as lifeboats and a taxi homefor the six spaceflyers aboard. An unmanned Progress cargo ship is docked atthe remaining Russian port. TheMini-Research Module 2 will also serve as an airlock for Russian spacewalks andwill have exterior attach points for future experiments, NASA officials said. Russia?sFederal Space Agency built two Mini-Research Modules for the station at thesame time and always planned to launch the first one completed to the outpostatop an unmanned booster, NASA officials told SPACE.com. Mini-ResearchModule 2 was completed slightly ahead of its counterpart and jumped to the headof the line, they added. NASA andRussia plan to launch the Mini-Research Module 1 to the station in May 2010aboard the U.S. space shuttle Atlantis. Wednesday?sspacewalk was the 125th excursion dedicated to stationconstruction and maintenance. It was the eighth spacewalk for Padalka, whofinished with 27 hours and 15 minutes of spacewalking time. It was the secondcareer spacewalk for Barratt, who ended with just over five hours of orbitalwork. The six menaboard the space station have an extended rest period ahead as they prepare forthe arrival next week of NASA?s shuttle Endeavour and seven more astronauts. Endeavouris slated to launch Saturday morning from Florida to deliver a porch-likeexperiment platform for the station?s Japanese Kibo lab, as well as new solararray batteries and spare parts. Five spacewalks are planned for the 16-dayshuttle mission.